This landscaping project in Dollar really complimented the farm steading, bringing shape and texture to the garden along with the introduction of planting, pots and containers, injecting lots of colour and vibrancy. The existing garden consisted of an area of lawn and a small paved area along the rear of the property. The client had a clear brief to create a low maintenance garden by introducing paved areas along with a raised patio area for sitting and relaxing. We also were tasked with cleverly disguising the existing oil tank into our design. Curved steps leading to a beautifully shaped raised patio area. 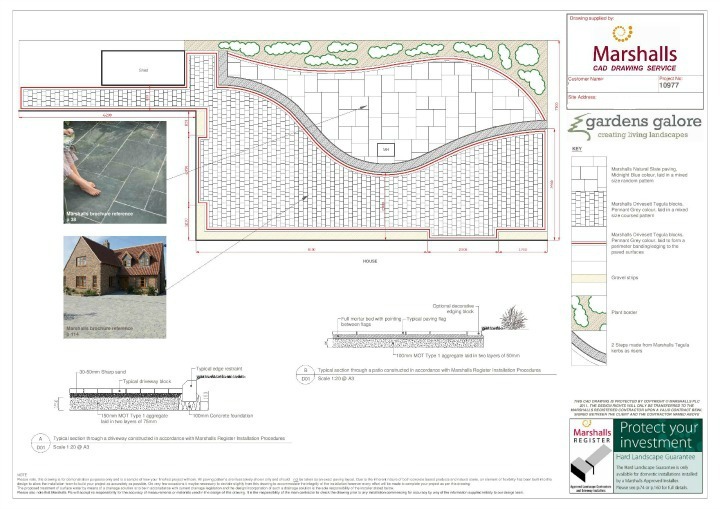 Paved areas providing access to the property, path and shed area – providing lots of space for relaxation. Border area planted up with carefully chosen plants, providing a mix of colours, textures and scents. The mix of traditional tegula blocks and midnight blue slate paving provide a real contrast of colour and texture. The design brings shape to the garden bringing soft curves and lines. The finished garden provided a low maintenance solution to our clients. The design met with their requirements of introducing paved areas offering space for bench seating and places to sit and relax or entertain with family and friends. We felt the mix of materials worked really well contrasting between the more traditional look of the tegula blocks, in keeping with the steading, teamed with the more modern feel of the midnight blue slate paving – bringing together an attractive mix of old and new. "From start to finish dealing with Gardens Galore has been a pleasure. The initial planning process was thoughtful, imaginative and fully responsive to our own ideas. Firm dates and times were given and strictly adhered to while the construction team was super- efficient and highly skilled. Their work has drawn unqualified praise from all who have seen it."